5.74 m of textual records, ca. 52 posters, 93 optical disks and other material. Derek Alexander Beaulieu was born in 1973 and lives in Calgary, Alberta. He has one child, Madeleine. Beaulieu worked as Managing Editor and Poetry Editor of “filling Station” magazine on and off between 1998 and 2008. He was Administrative Director at The New Gallery in Calgary from 2003 to 2006. Beaulieu founded housepress and was its editor and publisher from 1997 to 2004. He founded No press, a micropress with a focus on limited-run chapbooks dedicated to experimental, concrete and conceptual writing, in 2005. Beaulieu has taught creative writing and contemporary Canadian literature with the Calgary Board of Education, the Alberta College of Art + Design, the University of Calgary and Mount Royal University. Books written by Beaulieu include “With Wax” (2003), “fractal economies” (2006), “frogments from the frag pool: haiku after basho” (2005), and “Please, No More Poetry: The Poetry of Derek Beaulieu” (2013). Edited book projects include “Shift & Switch: New Canadian Poetry” (co-edited with Jason Christie and Angela Rawlings, 2005), “Writing Surfaces: Selected Fiction of John Riddell” (co-edited with Lori Emerson, 2013), and “The Calgary Renaissance” (co-edited with rob mclennan, 2016). Beaulieu has published numerous articles, poems, reviews and Beaulieu has published essays in various anthologies and periodicals including “Canadian Literature,” “FFWD,” “filling Station,” “Lemon Hound,” “Open Letter” and “Rampike.” He has exhibited visual work in galleries such as the Brodsky Gallery, Niagara Arts Centre, TRUCK Gallery and Uppercase Gallery. He was the Poet Laureate of Calgary from 2014–2016 and is the Visual / Concrete Poetry Editor for Ubuweb. Records were in the custody of Derek Beaulieu prior to their acquisition by Simon Fraser University Library Special Collections and Rare Books in 2005, 2009, 2011, 2013 and 2015. Accruals were processed together. Fonds consists of records created or accumulated by Derek Beaulieu through his personal and professional activities, primarily from the 1990s to 2015. Records document his work as publisher of housepress and No press, and his work as a writer, editor, art and literature student and creative writing instructor. Fonds is arranged into the following eight series: housepress (1997–2007); No press (2005–2015); Writings (1991–2015); Correspondence (1994–2015); Artworks (1996–[before 2013]); Notebooks, sketchbooks and daytimers (1987–2015); Promotional records ([199-]–) and Personal records (1994–2007). 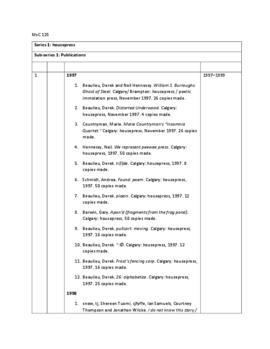 Arrangement of the fonds was based on Derek Beaulieu’s division of records in inventories accompanying the material. Publications in the fonds, including books, journals and chapbooks, were catalogued and are linked to MsC 125 in their catalogue records. Accruals were processed together as one unit. 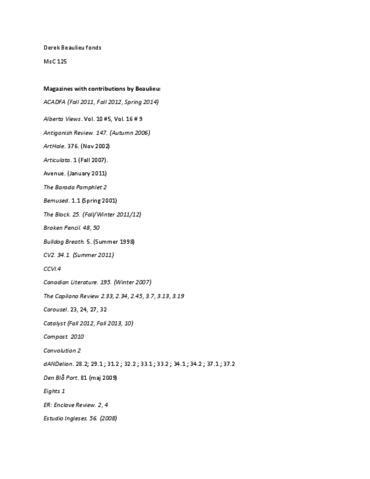 A list of Beaulieu's magazine contributions and association copies is attached to this finding aid as an appendix. Works in this series, e.g. poetry, music, essays, and other written material, are under copyright. 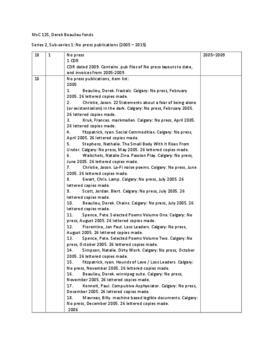 Researchers are required to secure permission from the copyright holder(s) for uses of this material other than those covered by fair dealing. Records containing personal information are restricted.